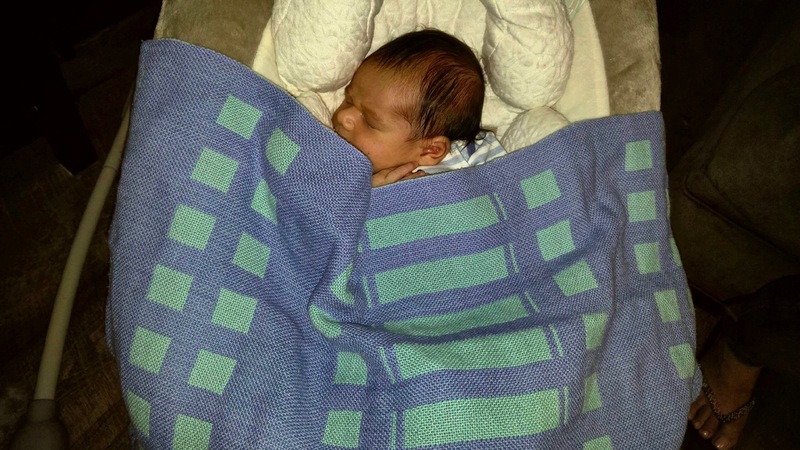 Handwoven baby blankets are for cuddling babies. It is a pleasure to weave a baby blanket for a dear friend’s first grandchild. As long as I’m dressing the loom, it makes sense to weave more than one. So the second baby blanket is for cuddling my own grand-babies when they come to visit. Double weave baby blankets unrolled from the cloth beam, ready to be cut off. 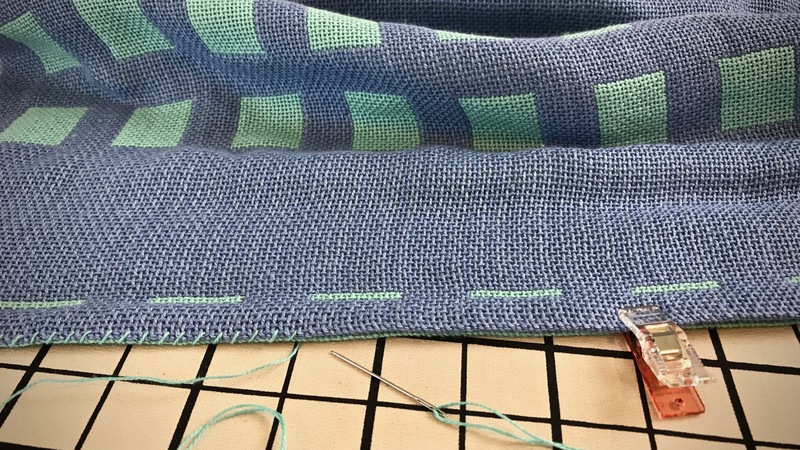 Double weave top and bottom layers are stitched together by hand at the hems. Contrasting thread is used for a decorative embroidered look. Blankets are triple washed for softness. Ready to touch baby’s skin. Double weave has reverse pattern on the back. Meet Julian, my friend’s new grandson, wrapped in love. A resting baby is a picture of hope. Hope for the next feeding, hope in the mother’s tender love, hope in the father’s secure arms. No arrogance, no illusion of grandeur. Just quiet rest. Hope in the Lord looks like this. Hope for today, the future, and forever. My soul is at rest—in complete rest and trust. Like a resting baby in his mother’s arms. Like a baby wrapped in a blanket woven especially for him. These are really wonderful. Curious to know what kind of yarn/thread you are using to make these? 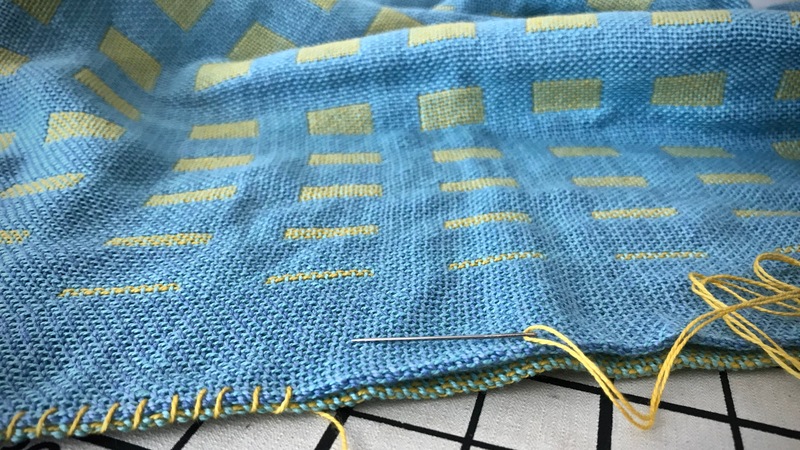 I was introduced to double weave last year and plan to tackle a small project in the coming new year (once I finish the overshot table runners I’m working on now). Your blog is a regular inspiration to me, both in spirituality and productivity. Thank you. Hi Cate, I’m so happy to have you here. If you find something that inspires you, I’ve accomplished my purpose. Thank you! 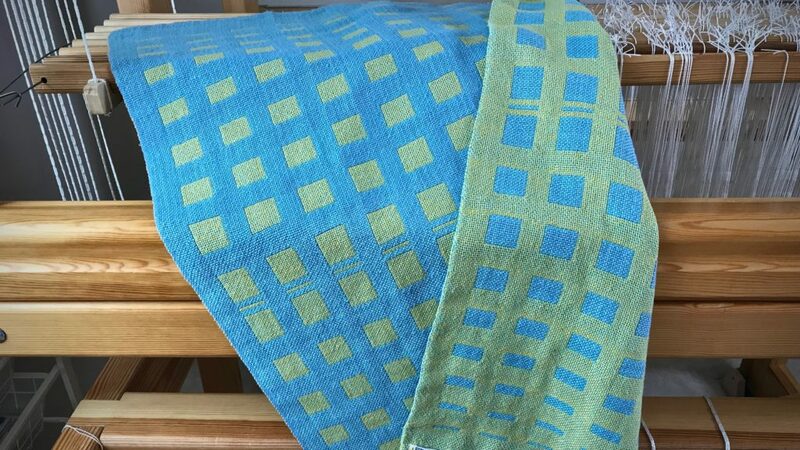 I used Bockens 8/2 cotton in warp and weft for these blankets. I like the feel of washed cotton. I’m sure your overshot table runners are lovely! Wow! They are beautiful, Karen! The blankets and the babies. What a great use for double weave. Hi Beth, I’m glad you like them! At this age, babies are good blanket models. 🙂 The double weave was so much fun to do. I haven’t tried double weave yet, but these blankets definitely make me want to try! Unfortunately, all of my grandchildren are too old for swaddling blankets. Guess I will just need to make bigger ones! Thank you for the inspiration, both spiritually and weavingly. Hi Annie, The baby stage doesn’t last very long, does it? Because of the double layers, a double weave blanket would be good for any age. I wouldn’t mind having one my size! 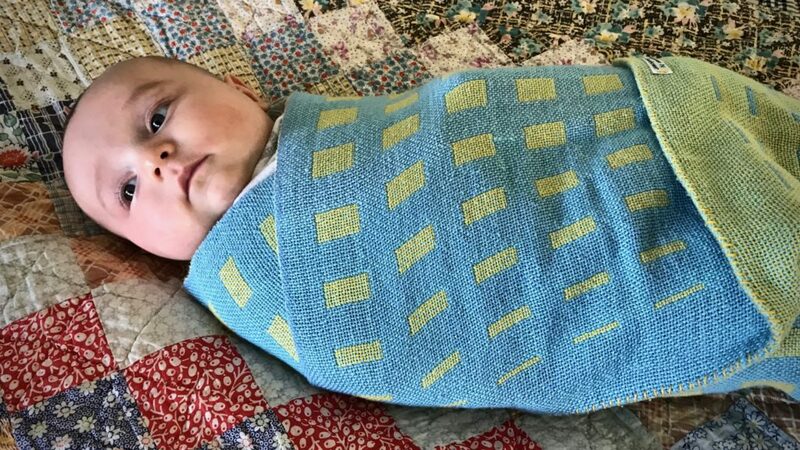 Beautiful- What size do you make your baby blankets? Hi Joan, These baby blankets are 22″ x 31″. I wanted them to be on the small side, to use with a newborn. Hi Andrea, This is a draft from The Big Book of Weaving, by Laila Lundell. I varied the pattern slightly from the pattern in the book to give the design some of my own details. You’re right, this would be a super project to learn double weave. What wonderful love filled blankets to cuddle the wee ones. 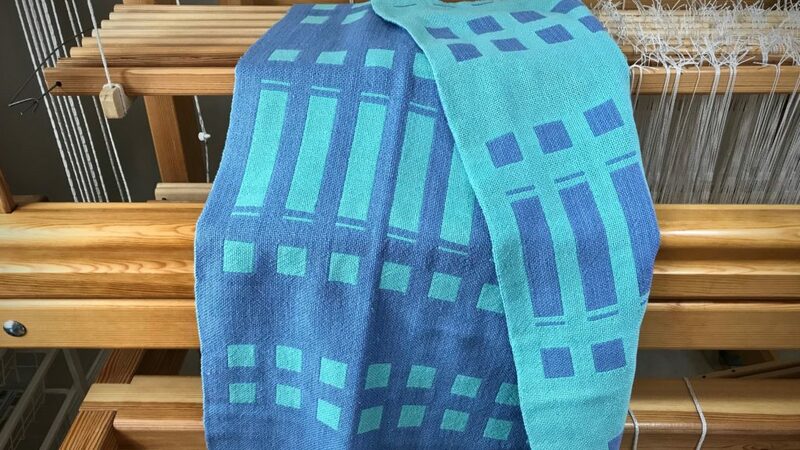 Nice choice of colors – Lovely weaving as always. The hand made quilt is extra special too! Hi Martha, My friend helped choose the colors for her grandson’s blanket. I like her choice! I enjoy keeping my Grandmother’s handmade quilt where I can see it and use it every day. I’m fond of connecting the past generations with the present. These are stunning! 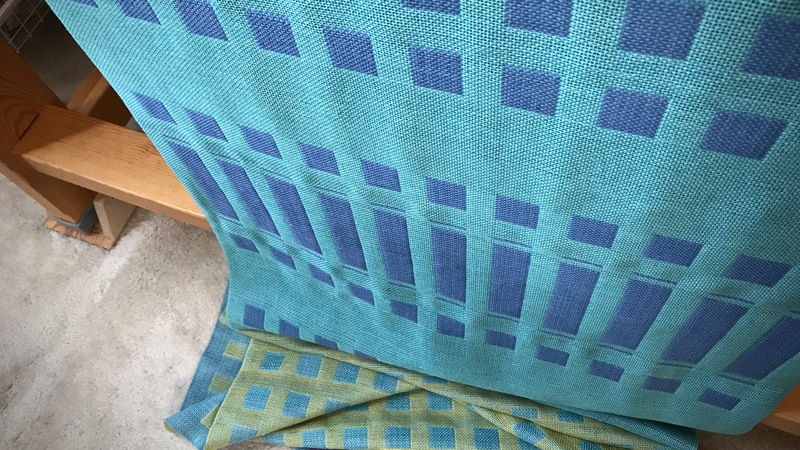 I’ve done a double weave project in a class using an 8 shaft table loom but I’m not at all sure how to dress my Glimakra floor loom for double weave. Did you use an extra beam ? Would be great to see how you dressed your loom for a double weave project. I followed your advice on sorting out the length of my treadle cords to improve the shed – worked a treat – thank you. Hi Susie, Great question! There wasn’t anything unusual in dressing the loom for this project. No second beam, since both layers are the same plain weave. The double weave is simply set up in the threading. You can find this draft in The Big Book of Weaving, by Laila Lundell. Thanks for letting me know the advice about treadle cords worked for you. That makes me very happy! 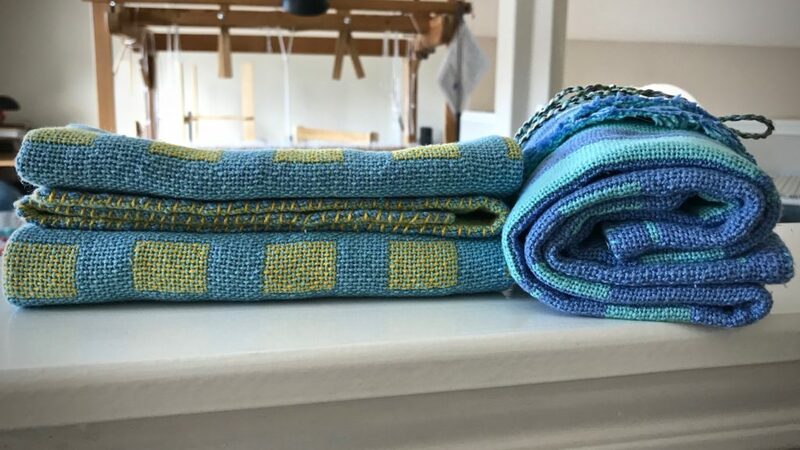 Your lovely handwoven baby blankets for adorable Benjamin and Julian are destined to become family heirlooms just like your grandmother’s quilt. Wouldn’t your grandmother enjoy knowing you are using and loving her quilt! Hi D’Anne, I’m sure my grandmother never imagined how much her handmade quilts would be enjoyed! It’s a sweet thought that my woven blankets could become heirlooms like that. Beautiful! and what a good idea for double weave. Hi Tobie, thanks so much! The double weave worked well for this, and it was pretty easy to do. I truly enjoy reading your blog and the comments. My newest grandchild is only 3 months old and the double weave blanket is a great idea! Many thanks for your thoughtfulness! I, too, enjoy connecting the generations and have been delighted to see in photos my granddaughters with the quilts I’ve made for them–and items I saved from their mother’s childhood being used again! I enjoy reading the comments, too. I’m thrilled when the conversation keeps going. Yes, those handmade articles, like your quilts, are threads that make memories and help tie families and generations together.